An interesting problem develops when the termination of an employee involves a severance package and part of that package is the requirement to continue benefits such as Long Term Disability Insurance. The HR Departments often times will panic when they realize they can no longer keep the terminated employee on the group LTD plan. Unfortunately, securing an individual plan is not an available option since the person is currently unemployed. Keep your clients financially secure with one of our tailored high limit disability plans. Disability coverage for a terminated employee and his or her family is a high expense, and certainly not a cost the company will want to cover. When the Traditional Market fails to provide an acceptable solution, Petersen International Underwriters can solve the problem with High Limit Disability Insurance. This type of insurance will guarantee that long term disability insurance plan in the severance package is upheld. PIU’s Severance Agreement Disability Insurance will keep the terminated employee and his family safe, as well as keep the company from a major financial loss. 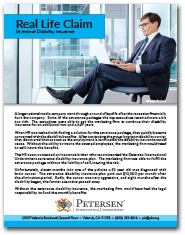 Click the following image to download a Real Life Claim story. Mr. L, age 57, an executive of a bank had in place a severance agreement in the event of a “change in control”. Finding his job to be redundant the new management terminated Mr. L. Under the severance agreement the continuation of certain benefits included that of the group LTD plan. When HR contacted they group carrier to arrange for this change, they advised that they would not be able to provide continuing coverage due to the fact that Mr. L was no longer on the payroll. The HR department then reached out to the individual market and were advised that they too could not help since Mr. L was currently unemployed. Who could help in this tough situation? 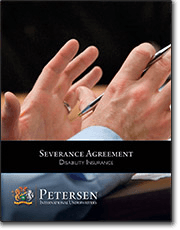 The Petersen International Underwriters severance disability plan took care of the problem.